Cheerful Madness!! 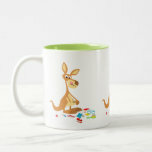 : Cute Rummaging Cartoon Kangaroo Two-Tone Coffee Mug Cheerful Madness!! Cute Rummaging Cartoon Kangaroo Two-Tone Coffee Mug Cheerful Madness! !